Aberdeen Arts Centre is a theatre on King Street in Aberdeen, Scotland with a 350-seater auditorium. It is a Category A listed building. Formerly ACT Aberdeen, Aberdeen Arts Centre has charitable status and is a community-focused arts venue, which aims to provide facilities and opportunities for individuals of all ages, backgrounds and abilities to engage in the performing arts. The theatre is on two levels, with an upper and a lower gallery for audiences. There is a small orchestra pit and behind the stage there are dressing and rehearsal rooms for the shows and other projects such as local drama groups. The building also houses an exhibition area which hosts local and visiting art shows. 2007 has seen the start of an artist in residence programme at the arts centre. The first artist was Will Teather. 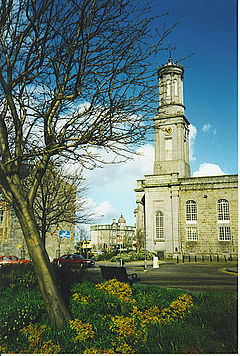 The centre was the subject of controversy in 1998 when Aberdeen City Council withdrew core funding from the venue. A team of local people, led by Annie Inglis M.B.E, joined forces to take over the lease of the building and established Castlegate Arts Ltd, a volunteer led charity which now runs the centre. ^ Historic Environment Scotland. "33 King Street, Aberdeen Arts Centre (Category A) (LB19946)". Retrieved 26 March 2019. 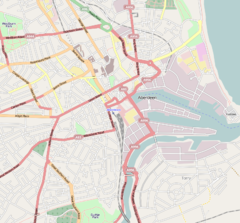 This article related to Aberdeen, Scotland, is a stub. You can help Wikipedia by expanding it.